For self-navigating guided cruise missiles, see Cruise missile. 2. The missile shroud (E) is ejected. 8. The nuclear warheads detonate. A ballistic missile follows a ballistic trajectory to deliver one or more warheads on a predetermined target. These weapons are only guided during relatively brief periods of flight—most of their trajectory is unpowered, being governed by gravity and air resistance if in the atmosphere. Shorter range ballistic missiles stay within the Earth's atmosphere, while longer-ranged intercontinental ballistic missiles (ICBMs), are launched on a sub-orbital flight trajectory and spend most of their flight out of the atmosphere. These weapons are in a distinct category from cruise missiles, which are aerodynamically guided in powered flight. The earliest use of rockets as a weapon dates to the 13th Century (see History of rockets). A pioneer ballistic missile was the A-4, commonly known as the V-2 rocket developed by Nazi Germany in the 1930s and 1940s under the direction of Wernher von Braun. The first successful launch of a V-2 was on October 3, 1942, and it began operation on September 6, 1944 against Paris, followed by an attack on London two days later. By the end of World War II in Europe in May 1945, over 3,000 V-2s had been launched. The R-7 Semyorka was the first intercontinental ballistic missile. A total of 30 nations have deployed operational ballistic missiles. Development continues with around 100 ballistic missile flight tests in 2007 (not including those of the US), mostly by China, Iran, and the Russian Federation. In 2010, the U.S. and Russian governments signed a treaty to reduce their inventory of intercontinental ballistic missiles (ICBMs) over a seven-year period (to 2017) to 1550 units each. Ballistic missiles can be launched from fixed sites or mobile launchers, including vehicles (e.g., transporter erector launchers (TELs)), aircraft, ships, and submarines. The powered flight portion can last from a few tenths of seconds to several minutes and can consist of multiple rocket stages. When in space no more thrust is provided, the missile enters free-flight. In order to cover large distances, ballistic missiles are usually launched into a high sub-orbital spaceflight; for intercontinental missiles, the highest altitude (apogee) reached during free-flight is about 2,000 kilometers (1,200 mi). The re-entry stage begins at an altitude where atmospheric drag plays a significant part in missile trajectory, and lasts until missile impact. Reentry vehicles reenter the Earth's atmosphere at very high velocities, on the order of 6-8 kilometers (4–5 miles) per second at ICBM ranges. The course taken by ballistic missiles has two significant desirable properties. First, ballistic missiles that fly above the atmosphere have a much longer range than would be possible for cruise missiles of the same size. Powered rocket flight through thousands of kilometers of air would require vastly greater amounts of fuel, making the launch vehicles larger and easier to detect and intercept. Powered missiles that can cover similar ranges, such as cruise missiles, do not use rocket motors for the majority of their flight, but instead use more economical jet engines. However, cruise missiles have not made ballistic missiles obsolete, due to the second major advantage: ballistic missiles can travel extremely quickly along their flight path. An ICBM can strike a target within a 10,000 km range in about 30 to 35 minutes. With terminal speeds of over 5,000 m/s, ballistic missiles are much harder to intercept than cruise missiles, due to the much shorter time available. Therefore, ballistic missiles are some of the most feared weapons available, despite the fact that cruise missiles are cheaper, more mobile, and more versatile. Trident II SLBM launched by ballistic missile submarine. 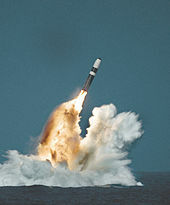 Submarine-launched ballistic missile (SLBM): Launched from ballistic missile submarines (SSBNs); Most current designs have intercontinental range with a notable exception of Indian operational SLBM Sagarika and K-4 as well as North Korea's currently operationally deployed KN-11 which might not have intercontinental range. A comparable missile would be the decommissioned China's JL-1 SLBM with a range of less than 2,500 km. Tactical, short- and medium-range missiles are often collectively referred to as tactical and theatre ballistic missiles, respectively. Long- and medium-range ballistic missiles are generally designed to deliver nuclear weapons because their payload is too limited for conventional explosives to be cost-effective in comparison to conventional bomber aircraft (though the U.S. is evaluating the idea of a conventionally armed ICBM for near-instant global air strike capability, despite the high costs). Throw-weight is a measure of the effective weight of ballistic missile payloads. It is measured in kilograms or tonnes. Throw-weight equals the total weight of a missile's warheads, reentry vehicles, self-contained dispensing mechanisms, penetration aids, and missile guidance systems—generally all components except for the launch rocket booster and launch fuel. While throw-weight may refer to any type of warhead, in normal modern usage it almost exclusively refers to nuclear or thermonuclear payloads. It was once also a consideration in the design of naval ships and the number/size of guns they carried. Throw-weight was used as a criterion in classifying different types of missiles during Strategic Arms Limitation Talks between the Soviet Union and the United States. The term became politically controversial during debates over the arms-control accord, as critics of the treaty alleged that Soviet missiles were able to carry larger payloads and therefore enabled the Soviets to maintain higher throw-weight than an American force with a roughly comparable number of lower-payload missiles. The missiles with the world's heaviest payloads are the Russian SS-18 and Chinese CSS-4 and Russia is developing a new heavy-lift, liquid-propellant ICBM called the Sarmat. Throw-weight is normally calculated using an optimal ballistic trajectory from one point on the surface of the Earth to another. An optimal trajectory maximizes the total payload (throw-weight) using the available impulse of the missile. By reducing the payload weight, different trajectories can be selected which either extends the nominal range, or decreases the total time in flight. A depressed trajectory is a non-optimal, lower and flatter trajectory which takes less time between launch and impact, but with a lower throw-weight. 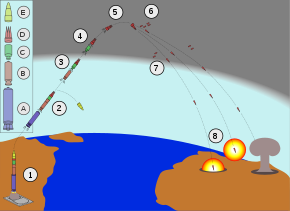 The primary reasons to choose a depressed trajectory are either to evade anti-ballistic missile systems by reducing the time available to shoot down the attacking vehicle (especially during the vulnerable burn-phase against space-based ABM systems), or in a nuclear first-strike scenario. An alternate, non-military, purpose for a depressed trajectory is in conjunction with the space plane concept with use of air-breathing engines, which requires the ballistic missile to remain sufficiently low inside the atmosphere for air-breathing engines to function. ^ Zaloga, Steven (2003). 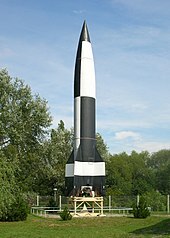 V-2 Ballistic Missile 1942–52. Reading: Osprey Publishing. p. 3. ISBN 978-1-84176-541-9. ^ Clayton K. S. Chun (2006). Thunder Over the Horizon: From V-2 Rockets to Ballistic Missiles. Greenwood Publishing Group. p. 54. ^ U.S. Department of State (8 April 2010). "Treaty between the United States of America and the Russian Federation on Measures for the Further Reduction and Limitation of Strategic Offensive Arms": https://www.state.gov/documents/organization/140035.pdf. Retrieved 25 November 2018. ^ Almasy, Steve; Kwon, K. J.; Lee, Taehoon (14 May 2017). "North Korea launches missile". CNN. Retrieved 2017-10-14. ^ a b "Ballistic and Cruise Missile Threat". Defense Intelligence Ballistic Missile Analysis Committee. June 2017. ^ James John Tritten, Throw-Weight and Arms Control, Air University Review, Nov-Dec 1982. ^ New York Times, What Is Throw-Weight?, July 15, 1991. Futter, Andrew (2013). Ballistic Missile Defence and US National Security Policy: Normalisation and Acceptance after the Cold War. Routledge. ISBN 978-0415817325. Neufeld, Jacob (1990). The Development of Ballistic Missiles in the United States Air Force, 1945-1960. Office of Air Force History, U.S. Air Force. ISBN 0912799625. Swaine, Michael D.; Swanger, Rachel M.; Kawakami, Takashi (2001). Japan and Ballistic Missile Defense. Rand. ISBN 0833030205.